I say "rather closer" because there was one item which I refrained from updating. In the latest version of Scrum, Sprint Planning is divided into two "themes". The first theme involves selecting the work from the Product Backlog that is to be completed, and agreeing a Sprint Goal. The second theme involves planning how that work will be implemented, such as by identifying tasks. In the prior version of the Scrum Guide these "themes" were treated as discrete and sequential steps (i.e. Sprint Planning Parts 1 and 2). There has been some controversy over this change, especially from the Large Scale Scrum community, and the Scrum Primer has not been updated to reflect "theme based" planning. Moreover, it should be observed that conducting Sprint Planning in sequential parts is a valid prescription for implementing the themes referred to in the Guide. I have therefore elected to retain the original advice of conducting planning in two parts*. The changes I made to the DZone reference card are summarised below. *Note: neither this reference card nor the Primer represent the official definition of Scrum, no matter how terse and concise they might be. The Scrum Framework is defined by the Scrum Guide itself. 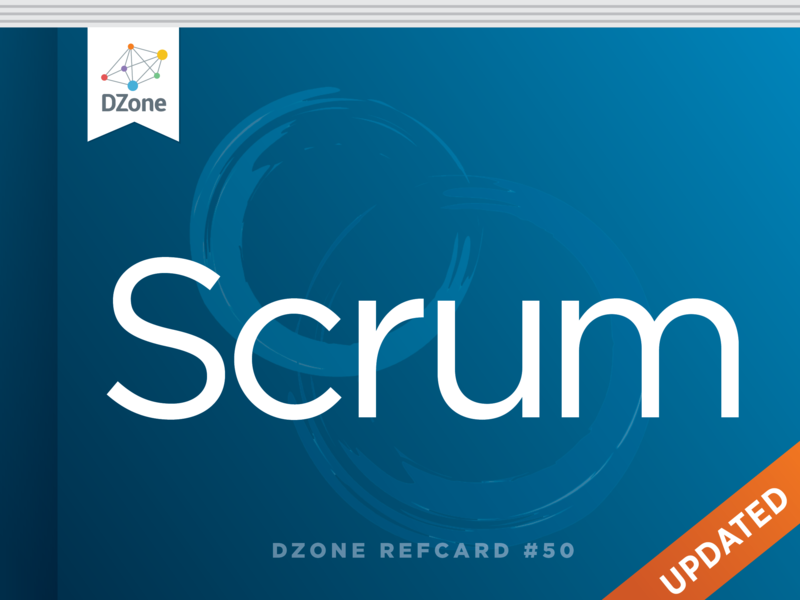 The DZone reference card, and the Scrum Primer for that matter, ought to be viewed as interpretive expressions of that canonical definition. Scrum is a simple management framework for incremental product development using one or more cross-functional, self-organizing teams of about seven people each. Scrum is a simple management framework for incremental product development using one or more cross-functional, self-organizing teams of between three and nine people each. Scrum teams use fixed length iterations, called Sprints, typically two weeks or 30 days long. They attempt to build a potentially shippable (properly tested) product increment every iteration. Scrum teams use fixed length iterations, called Sprints, typically two weeks or 30 days long. They attempt to build a potentially shippable (properly tested and integrated) product increment every iteration. They agree and observe a Definition of Done which asserts the quality of their completed work. A typical Definition of Done will assert that all work must be reviewed, tested thoroughly, and integrated. The Product Owner is the single individual responsible for return on investment (ROI) of the product development effort. The Product Owner owns the product vision, constantly re-prioritizes the Product Backlog, and revises release plan expectations. The Product Owner is the final arbiter of requirements questions, including which items are considered “done” at the Sprint Review Meeting. The Product Owner is the single individual responsible for return on investment (ROI) of the product development effort. The Product Owner wholly owns the product vision and the Product Backlog, which he or she updates and reprioritizes. The Product Owner communicates release expectations with stakeholders. The Product Owner is the final arbiter of requirements questions, and makes the decision whether or not to release an increment. The Team is a self-organizing/-managing group of about seven (give or take two) individuals. While the Team may contain specialists, collectively it is cross-functional, containing the range of skills (including testing) which were traditionally found in different departments. The Team is given autonomy regarding how to achieve the commitments they’re held responsible for between the Sprint Planning and Sprint Review meetings. The Development Team is a self-organizing/-managing group of between three and nine individuals. While the Team may contain specialists, collectively it is cross-functional, containing the range of skills (including testing) which were traditionally found in different departments. The Team is given autonomy regarding how to achieve the Sprint Goal. However, all work is expected to satisfy a Definition of Done. The Definition of Done asserts the quality of the completed work and provides assurance to the Product Owner that the increment is potentially releasable. All Scrum Meetings are facilitated by the ScrumMaster, though he has no decision-making authority at these meetings. Scrum Meetings are time-boxed events that may be facilitated by the ScrumMaster, though he or she does not have to be there and has no decision-making authority. However, the Scrum Master is expected to coach the team to follow the rules of Scrum at these meetings and throughout each Sprint. Part 2: The Team decomposes the selected Product Backlog Items into an initial list of Sprint Tasks and makes a final commitment to do the work. The Product Owner’s full attendance is often not necessary during Part 2. The maximum time for planning a 30-day Sprint is 8 hours. Part 2: The Team decomposes the selected Product Backlog Items into an ordered plan of work, typically tasks, and makes a final commitment to the Sprint Goal. This plan is called the Sprint Backlog, and it represents the forecast of work needed to achieve the Goal as per the Definition of Done for a release-quality increment. The Product Owner’s full attendance is often not necessary during Part 2. The maximum time for planning a 30-day Sprint is 8 hours. Every day, at the same time and place, the Scrum Development Team members spend 15 minutes reporting to each other. Each team member reports to the rest of the team what he did the previous day, what he will do today, and what impediments he has. Every day, at the same time and place, the Scrum Development Team members spend 15 minutes refocusing their joint efforts on achieving the Sprint Goal. Each team member clarifies to the rest of the team what he did the previous day, what he will do today, and whatever impediments he or she may have. The Scrum Master is expected to mitigate any such impediments on behalf of the team. At the end of each Sprint execution, the Team demonstrates the actual working product increment they built to the Product Owner and other stakeholders. The Product Owner declares which committed items will be considered “done” according to the previously negotiated agreement. Incomplete items are returned to the Product Backlog as candidates for future Sprints. Feedback from stakeholders is converted to new Product Backlog Items. At the end of each Sprint execution, the Team demonstrates the actual working product increment they built to the Product Owner, and other stakeholders invited at his or her discretion. Any undone work remaining from the Sprint Backlog is examined. Incomplete items are re-estimated and returned to the Product Backlog as candidates for future Sprints. Feedback from stakeholders may be converted to new Product Backlog Items. As with the Daily Scrum, the team may choose to invite the Product Owner. Candid communication will help the team gain common understanding of multiple perspectives and come up with actions that will take the team to the next level. All Scrum Team members – that is to say, the Development Team, the Scrum Master, and the Product Owner – are expected to attend each Sprint Retrospective. Candid communication will help the team gain common understanding of multiple perspectives and come up with actions that will take the team to the next level. This meeting lacks an official name, thus may also be called “Backlog Maintenance,” “Backlog Grooming,” “Backlog Estimation Meeting,” etc. This meeting lacks an official name and is not a formal Scrum Event. It is an ongoing activity which may also be called “Backlog Maintenance,” “Backlog Grooming,” “Backlog Estimation Meeting,” etc. Organizations seeking to scale Scrum are advised to pursue training, coaching, and to examine previous case studies. Organizations seeking to scale Scrum are advised to pursue training, coaching, and to examine previous case studies. Scaling frameworks and studies of their application can be found on the site agilepatterns.org. Scrum is a general management framework coinciding with the agile movement in software development, which is partly inspired by Lean manufacturing approaches such as the Toyota Production System. Scrum has been popularized by people like Ken Schwaber, organizations like the Scrum Alliance, and companies like Danube Technologies, Inc. Scrum is a general management framework coinciding with the agile movement in software development, which is partly inspired by Lean manufacturing approaches such as the Toyota Production System. Scrum has been popularized by people like Ken Schwaber, organizations like the Scrum Alliance and Scrum.org, and companies like Danube Technologies, Inc.
Scrum is mainly an oral tradition conveyed through Certified ScrumMaster (CSM) courses. These are typically two-day events led by trainers who have been vetted by the Scrum Alliance 13 . The CSM credential does not prove proficiency. It is intended as a stepping stone toward Certified Scrum Practitioner (CSP), an indication of at least one year of experience doing Scrum. The Scrum Alliance also certifies Scrum Product Owners, coaches, and trainers. Scrum is mainly an oral tradition conveyed through Certified ScrumMaster (CSM) courses. These are typically two-day events led by trainers who have been vetted by the Scrum Alliance 13 . The CSM credential does not prove proficiency. It is intended as a stepping stone toward Certified Scrum Practitioner (CSP), an indication of at least one year of experience doing Scrum. The Scrum Alliance also certifies Scrum Product Owners, coaches, and trainers. The Scrum co-founder, Ken Schwaber, has founded an alternative certification body, Scrum.org. This body puts a greater emphasis on high-stakes online examinations and classroom attendance is usually optional.